And why do they so often get re-injured in spite of your best efforts? And Tennis Elbow is certainly a muscle and tendon injury. Time and rest are NOT what’s most important – especially not in the mid to latter stages of the healing process. So you can break the vicious Tennis Elbow cycle once and for all – and get back that pain-free strength and confidence in your muscles and tendons as fast as possible. …and inflammation speeds that process, among other things. In which case, it makes sense to do some icing at first to reduce the swelling. That’s almost never the problem with persistent, slow-healing tendon injuries though. The problem is more likely the opposite – There isn’t enough circulation to the damaged tendon – And not enough inflammation! And that’s why healing is going too slowly – or it’s not happening at all – and ice is only going to make that worse. And I hate to tell you this, but this is a necessary part of the healing process, too! You see, any tearing that happens in muscle or tendon - whether it’s a larger tear or a smaller, microscopic tear – gets fixed with Scar Tissue. And, I know this will probably sound crazy… But, there IS such a thing as “good” scar tissue – just as there’s “bad” scar tissue. And it’s Step Three the healing process, that’s supposed to make this happen. It’s supposed to finish the job started by inflammation and scarring – and help make the repair stronger and more flexible, because it certainly doesn’t start out that way. Now, in order to visualize this process, imagine we’re looking through a microscope, and this is the magnified view of some muscle fibers, which have torn. The scar that forms is a rough and lumpy mess, in the beginning – isn’t it? You don’t get an instant, perfect repair – What you get is more like a rough draft that’s going to take a lot of revising. It’s called the Remodeling stage – And it’s all about making – or REmaking this rough, initial repair into something BETTER, stronger and more flexible. This is a hugely important step, and one of the most valuable things I have to share with you, considering how neglected this step usually is. The remodeling stage is one of the biggest challenges in the healing process – Because it’s a point at which healing very often stalls. And let me tell you, the scar tissue can easily stay stuck like this, indefinitely, as is the rest of your life, unless you help the remodeling process. Which means that, knowing how to help it is one of the most important keys to better, faster, stronger healing. Don’t be surprised if you’ve never heard of remodeling, though, outside the context of fixing up some old house. You could scroll through a thousand WebPages about Tendonitis and you might NEVER find any mention of it. Why not – If it’s so important? I can only suggest that it’s probably because there’s no magic bullet for it: There’s no pill, no shot and no other symptom-focused medical treatment that will help it. 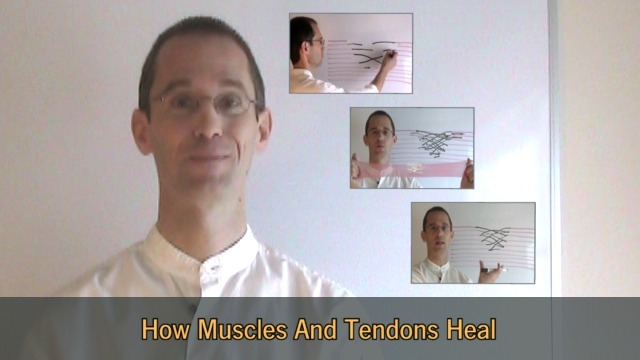 Now, let’s look at how the entire healing process plays out differently in muscles and tendons. They both have to go through much the same healing process – but their challenges and pitfalls are completely different. And the reason why you need to know this, is because muscles and tendons need very different therapies to help them through those challenges and help them finish healing. Let’s talk about muscles first. Muscles have the better blood supply and heal more easily. The challenge with muscles ends up being mostly with this remodeling stage we’ve been talking about. And the key action we need to be thinking about here is releasing! The remodeling of scar tissue in muscles is mostly about making sure it’s not all stuck and restricted – both to itself and to the surrounding area. Here I have some stretchy red stuff to represent a muscle, (which is red in color as you know) – and this white tape represents some scar tissue, which does happen to be whiteish colored. As you can see, the scar tissue, which has formed here to fix this tear in the muscle, is a random sticky mess - and therefore it’s not as flexible as it should be if it had been remodeled. There is a right time to begin, and sometimes that’s as soon as three days, to a week after the injury – but there are too many variables for me to just give you a set time frame. Of course with most cases of Tennis Elbow there is no single injury event – The damage has most likely been happening slowly over a long time – by the time the first symptoms even appear. Yes, it’s possible to start too soon and be too aggressive – but most tendonitis sufferers do the opposite: They rest too much, and wait too long. As I said in the beginning: Time and rest are NOT what’s most important – by the time we get to the remodeling stage of the healing process – rest becomes counterproductive! And the more time that passes, the more critical it becomes to manipulate that muscle – work that scar tissue, and encourage remodeling. It gets harder the longer we wait. And if there’s never any direct, hands-on manipulation of that scar tissue, to release and remodel it - it may never become the thinner, more flexible repair we want, and may stay a stuck, inflexible lump forever. Muscles are much more forgiving than tendons, though, and it’s fortunately hardly ever too late to start releasing and remodeling. So with tendons, the challenge, if there’s injury, is to keep the healing process going from start to finish, since it can stall on us at any stage – not just the last one, like with muscles. The key action in this case isn’t so much “releasing” – as it is with muscles – although that’s still part of the process – when it comes to tendons we need to think stimulation. And then to keep stimulating the tendon throughout the remodeling stage, with more pressure and friction, to make sure remodeling happens, and that it gets completed, so that initial scar tissue is made better and stronger. Now, there is more to the remodeling process than I can explain here, but the big thing I want you to takeaway from this – is that it just isn’t going to happen all by itself. Not completely anyway. Resting it too much, icing it, bracing it or taping it up – All of these things will slow down the circulation needed for the first two parts of the healing process – and delay the remodeling process. The healing of muscles and tendons is an active, dynamic process – Rest plays a very small role in their healing – unless the injury is severe, and most tendon problems are not. Sure, a little rest is important in the beginning – but less than most authorities would tell you, in my opinion. OK, so what about stretching and strengthening exercises? Now, I’m not saying they’re not important, you understand, they are important – I’m just saying they’re not enough – by themselves! and I’m afraid I have to say that almost everyone IS doing it wrong, and taking a big risk. And let’s be honest, re-injuries are notoriously common among people trying to strengthen injured tendons. The truth is, it’s very hard to stretch and exercise your way through the remodeling stage. I’m not going to go into this in detail, but one of the biggest reasons is that your own nervous system’s over protectiveness, for lack of a better word, tends to fight you every step of the way. It usually tries to guard the injury way too much, by resisting attempts to stretch and exercise – even when it’s desperately needed. This is by far, the most powerful thing you can do to speed the healing of injured muscles and tendons, in my opinion. IF you have just the right approach – The thing is, it needs to be very precise – because, as we covered, muscles and tendons need different things to help them heal. Tendons need to be stimulated a certain way, with one technique – to keep them repairing and remodeling – and muscles need to be released of excessive scar tissue that’s restricting them, through a different technique. The good news is that I can show you how to do just that, using the Tennis Elbow formula I’ve developed over the past five years of treating Tendon problems almost exclusively in my practice. I call it the three times three program. It centers around three powerful techniques for both releasing and stimulating all the muscles and tendons involved in Tennis Elbow, as the first step. Followed – only then – by the three most important strengthening exercises – which will be so much easier and more effective – once you know how to release your muscles, and stimulate your tendons to get them ready for exercising. All together, the program gives you the best tools to help you break the vicious cycle, and finally escape the Tennis Elbow Triple Trap. And it’s ready and waiting for you in the private, members area of Tennis Elbow Classroom, in easy to follow video tutorials, just like this one. I'll be your personal tutor guiding you through easy-to-follow lessons, where you'll get the therapy techniques, key stretches and essential exercises you need to treat and recover from your injury at home. My question: what do you recommend at this point in terms of pain management if I avoid the nsaids in order to allow the inflammation to do it’s job? I have kept up the nsiad drug regimen so that I can continue to function at work (high stress computer desk job) and work out to stay healthy and within a healthy weight. After reading your articles, I suspect that the nsaids are part of my problem, but I don’t know how to keep the arthritis from knocking me out of action and depressing me with pain without them. I want to try your methods for the elbow and maybe the patellar tendons and want to buy your program for sure. Do you recommend getting the video plan for my complicated issue? I have a 50% tear of the elbow tendon. I had tenotomy with prp and a bone spur chipped off. Im in my 4th week doing PT taking Vitamin D3 and collagen. I am a competitive golfer .